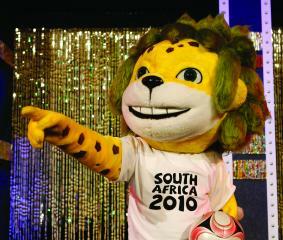 When South Africa rolls out the red carpet to host the 2010 FIFA (Federation of International Football Association) World Cup, executives in the travel, tourism and sports industries are hoping it will change the perception of the African continent as a future destination for business and international sporting events. Hosting the first World Cup in Africa is expected to be an economic boon to the continent in general and to South Africa in particular. In addition to generating more than 415,000 jobs, South Africa?s general domestic product will benefit from 33 billion rand (approx. US$3.4 billion) in direct spending from stadiums and infrastructure; 8 billion rand from visitors; 6 billion rand from ticket sales; and 750 million rand in sponsorship deals, according to a preliminary report by Grant Thornton Strategic Solutions. U.S. sponsors include The Coca-Cola Co., Visa Inc., Anheuser-Busch Cos., and McDonald?s Corp.
Economics aside, officials and business executives in South Africa and the United States alike are hoping that the 19th World Cup will foster new business relations between the two sides. ?The general objective is to give something back to Africa, a continent that has produced some of the greatest football talents in history,? says Delia Fischer, a FIFA media officer. ?But it is also to leave a legacy not only to African football but also to African society in general, and to do this in partnership and with the active participation of the local population.? To further promote Africa?s appeal as a sporting destination, the ATA held its second U.S. ?Africa Tourism Seminar in Washington, D.C., in February, with many of its panels focused on the business opportunities available from the surrounding countries, as well as opportunities in South Africa. ?Many African-Americans have traveled to Africa for cultural vacations and to foster a stronger relationship with the continent,? Bergman says. ?With the election of President Obama, we hope it even furthers that relationship and brings more interest to Africa. It will put us on a map to show the world that Africa can and will compete for these events.? Nichelle Gainey, CEO of? SilverStone International, a consulting firm, is already taking advantage of business opportunities with FIFA and South Africa. Her company, which has created soccer programs in historically Black universities, is part of the development team working on logistics and creating activities and events for fans during the World Cup. ?It is a tremendous opportunity because Africa has never hosted an international event, but we are ready to show the world that Africa can be a major player,? Gainey says. ?But the ultimate goal is to create a long-term relationship in the business and sports arena for South Africa, the FIFA and the U.S.?